The People's Guide 2015 30 4. Quarterly Reports You must fill out a QR-7 form every three months. This Is Very, Very, Very IMPORTANT! On the QR-7, you will be asked to report your income, property and household members. You also must report any changes you expect in the next three months. Your GR cash aid for the next three months will be based on the information you list on your QR-7. If you do not report income on your QR-7, you will be charged an overpayment. You will have to pay GR. They will take all of your cash aid for the month or longer until the overypayment is repaid. If this happens, call legal services for help (see pg. 68) If your other income gets really high (over what DPSS calls "income reporting thresh- old") you have to report it right away, even if your report is not due yet. You will get a notice telling you when you have to submit your QR 7 report form. When you get the form in the mail, you must fill it out and return it to the DPSS office by the fifth day of your "submit" month. You should get your QR-7 on the first of your "submit" month. If you don't get it in the mail, you must go to the DPSS office to fill out the form. Make sure to get a receipt showing the time and date you submitted the form. If your QR-7 gets lost, or you do not turn it in, your case will be terminated at the end of the "submit" month. You have until the 3rd Thursday of the following month to turn it in without getting a penalty. General Relief What Are My Rights? 1. Good Cause Unless you have "Good Cause," you will be penalized for not participating in GROW, quitting a job, not accepting a job paying at least minimum wage ($8 an hour), not complying with substance abuse requirements, or getting fired for misconduct. "Good Cause" can be any illness, accident, difficulty understanding instructions, conflicting appointments, confusion, transportation problems, or any physical or mental disability, which affects your ability to work. "Good Cause" covers anything short of willfully not complying with program requirements. If you are not able to comply with the GR program requirement, and you have "Good Cause," you should contact your DPSS worker immediately and explain your situation. 2. "Extended Suspend" If DPSS says you have not complied with your GR requirements your benefits will be stopped. If you comply with your GR requirements by the third Thursday of the following month, your benefits should be started again. The DPSS calls this "Extended Suspend. "Make sure you show them proof that you have complied with the rules. 3. Hearings If your case is going to be terminated or your benefits are reduced, you have a right to a GR hearing. The county must mail you a "Notice of Action" nine days before a hearing. The date and time of the hearing will be listed on the notice. If you have "Good Cause," you have a good chance of winning the hearing. Your benefits cannot be cut off or reduced without a hearing unless you do not go to the hearing. 4. Penalties or "Sanctions" If you do not go to your GR hearing, or you lose your GR hearing, your case will be terminated or your benefits will be reduced. If you receive a sanction and you have not been sanctioned in the past 365 days, you can re-apply at once. If this is the second sanction in a year, you can re-apply in 30 days. After the third penalty in a year, you have to wait 60 days to re-apply. 5. GR Time Limits If your General Relief is stopped due to the 9 month time limits, you can continue to get CalFresh/Food Stamps and Medi-Cal. You can reapply for GR in three months. Your notice will tell you when you can reapply. If you become sick or hurt and cannot work while you are timed off of GR, reapply for GR right away. Let your worker know that you are "unemployable" . If they find that you are unemployable you will be able to get GR cash aid without any time limit. 6. 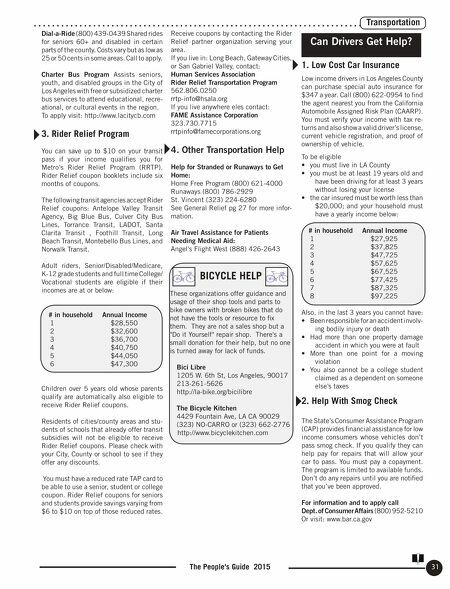 If You Begin to Get SSI The county considers GR to be a "loan" for those applying for SSI . If you start getting SSI, the amount of GR cash aid you got will be taken out of your first SSI check. If you think GR made a mistake and took too much money out you can ask for a fair hearing (see Hearings and Complaints pg. 66 ) Can I Get Help with Bus Fare? 1. 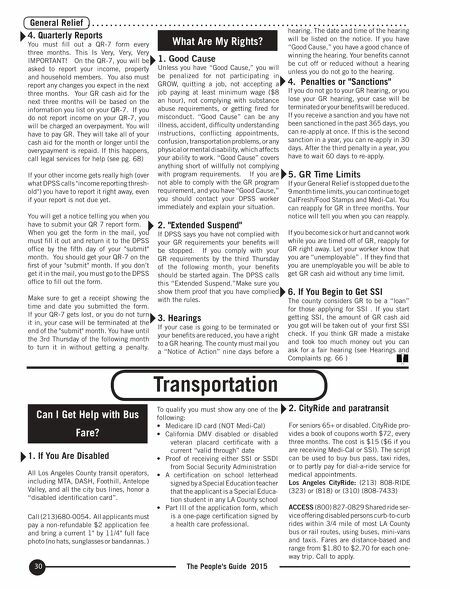 If You Are Disabled All Los Angeles County transit operators, including MTA, DASH, Foothill, Antelope Valley, and all the city bus lines, honor a "disabled identification card". Call (213)680-0054. All applicants must pay a non-refundable $2 application fee and bring a current 1" by 11/4" full face photo (no hats, sunglasses or bandannas. ) To qualify you must show any one of the following: • Medicare ID card (NOT Medi-Cal) • California DMV disabled or disabled veteran placard certificate with a current "valid through" date • Proof of receiving either SSI or SSDI from Social Security Administration • A certification on school letterhead signed by a Special Education teacher that the applicant is a Special Educa- tion student in any LA County school • Part III of the application form, which is a one-page certification signed by a health care professional. Transportation 2. CityRide and paratransit For seniors 65+ or disabled. CityRide pro- vides a book of coupons worth $72, every three months. The cost is $15 ($6 if you are receiving Medi-Cal or SSI). The script can be used to buy bus pass, taxi rides, or to partly pay for dial-a-ride service for medical appointments. Los Angeles CityRide: (213) 808-RIDE (323) or (818) or (310) (808-7433) ACCESS (800) 827-0829 Shared ride ser- vice offering disabled persons curb-to-curb rides within 3/4 mile of most LA County bus or rail routes, using buses, mini-vans and taxis. Fares are distance-based and range from $1.80 to $2.70 for each one- way trip. Call to apply.